In Sintra we rose early with tea and instant coffee to face what would become another one of those stand-out, unforgettable days of the trip. Days that we managed to fit so much fun activity and exploration into that they seem unhindered by the confines of space and time in retrospect. This day, in particular, unfolded with a self-guided tour of some of Sintra’s magnificent historical and palatial offerings. Due to its proximity to Lisbon, beautiful scenery and climate, Sintra has attracted a significant amount of wealth in the last few centuries. As a result, it is home to a high concentration of magnificent palaces and homes — some built in the 18th Century Romanticist style that the town in known for — and has earned UNESCO World Heritage status for its architectural merits. 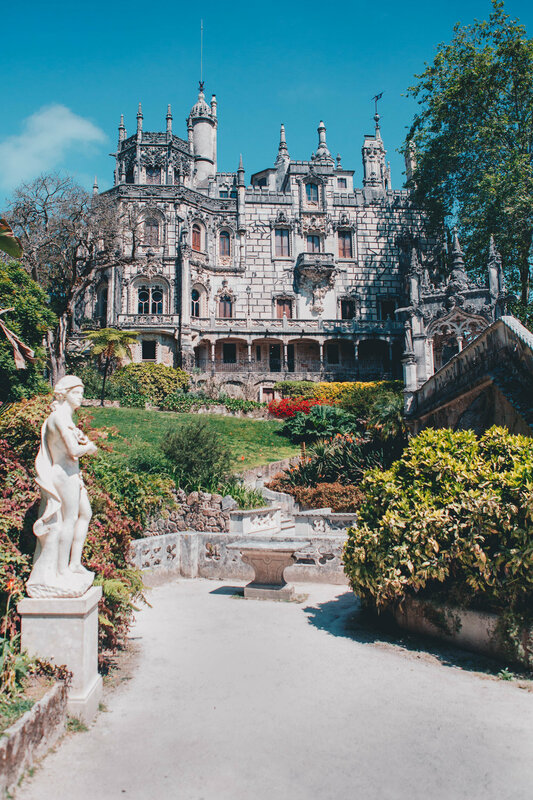 We mapped out a half-day hike that would take us by a few of the well known sites including Quinta de Regaleira, Pena Palace and the Moorish Castle. Probably the most interesting of the three is Quinta de Regalaria, the exterior of which is pictured above. The estate includes an extremely ornate home and grounds originally created by a man by the name of Antonio Augusto Carvalho Monteiro. With the help of Italian architect Luigi Manini, Monteiro set about building his dream estate with electric and eccentric details that reflect hidden symbolism of his ideology and interests. The masterfully designed grounds include secret tunnels and wells, mysterious buildings, waterfalls and more. The house itself is equally impressive with room after room of ornate decor and woodwork. After wandering around Quinta de Regalaria in wonder, we headed uphill via an old aqueduct that once supplied the area’s giant properties but now serves as a trail. We enjoyed checking out Pena Palace, Moorish Castle and the stunning views of the region one can glimpse at both. Eventually we made our way back down toward the center of town and packed up our car to head to the last city of our trip: Lisbon. Arriving in Lisbon we settled in after some slight hiccups with our apartment reservation. Not to be discouraged, we set out to check off one of our Lisbon must-do’s, experiencing Fado music in an authentic setting. Fado is a musical genre that is native to Lisbon and is still practiced by many talented musicians upholding the craft. It’s characterized by an expression of a feeling of longing using mournful tones and lyrics, and usually takes the form of a vocalist and a couple of stringed instruments. It is hauntingly beautiful. We waited in line to experience one of the most famous Fado clubs called A Tasca do Chico, where entry is still free on Mondays and the music is authentic. We were crammed into tiny tables and drinking generous helpings of sangria which made for a very easy atmosphere to converse with new friends all around us during the frequent intermissions. As soon as the lights were dimmed and the music began again, everyone in the room became absolutely captivated by the sad beauty of the song and the intimate nature of the venue itself. Fado is a very unique live music experience and one that should be sought out on any visit to Lisbon.